Our Mailing Software will make your folding and inserting machine smart. Without interfering with your ERP, CRM, Accounts package or computer system it reads the data you print and then it adds intelligence. Why use our mailing software? Create a closed loop system. Who should use mailing software? No need to separate jobs or programme your folder inserter - FlexStream can add OMR marks and/or barcodes to your documents. These marks are machine-readable instructions for your folding and inserting machine and could include telling your machine how many pages per recipient or what marketing material to include within the envelope. 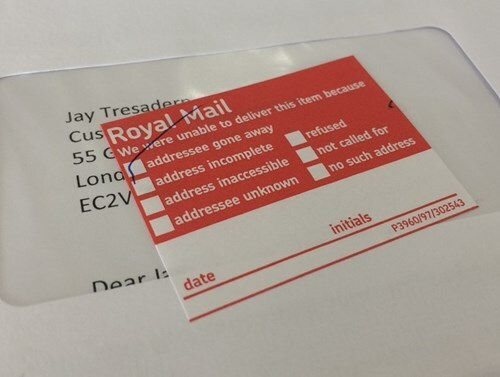 Improve mailing accuracy - The FlexStream software can check your mailing addresses against Royal Mail’s PAF file. Small errors such as a wrongly formatted postcode will be edited automatically but incorrect addresses are flagged to allow you to correct them. Having a high percentage of accurate addresses within your mailing will enable you to take advantage of the highest postal discounts. In addition to postage savings it is now very important that you protect your customer's data and checking addresses will assist with data protection compliancy (GDPR). Sort and consolidate mail - People don't like receiving several envelopes from the same sender on the same day. Money is also wasted each time this happens. Using our software your mailings can be sorted into any order but more importantly it can consolidate documents based on an account number or customer name. This means that your invoices or statements can be sent in the same envelope saving you money on postage and keeping your customers happy. No need to buy expensive custom envelopes - FlexStream software allows its users to move the address shown on your documents. This feature is priceless for anyone using a system that doesn’t allow (or requires expensive technical support) to edit a template. 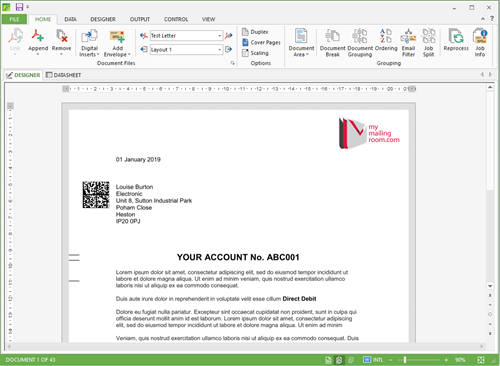 This is also a very useful feature for payslips, P60s, P45s or any documents printed in a landscape format. No need to store boxes of headed paper - In addition to adding marks and text to your documents, the FlexStream software can also add graphics including logos. The system is even clever enough to change this graphic based on the recipient. This is ideal if you have multiple brands as you can choose to print the logo your customer expects to see. This feature can also be used to display specific promotions based on a recipient’s history, choices or location. Add targeted marketing material or other notices - Using information captured from within your documents you can add marketing material and promotions to your documents. This could be printed on the reverse of your documents, add a new page or select a flyer from another feeder. 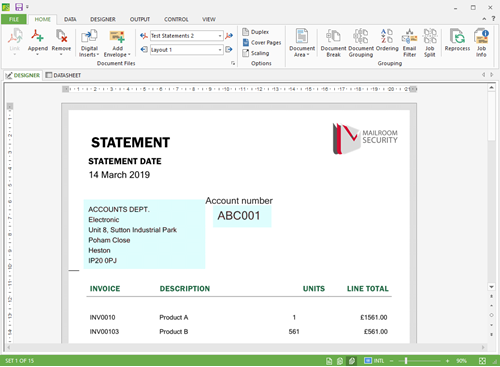 This could mean that if you generate an invoice for a specific product FlexStream can automatically add a promotional image to your original document or add a flyer for a related product to take advantage of a free ride. This also works extremely well if you have to include additional terms and conditions or add an “important information” sheet to your mailings. Mail can be sent centrally - Flexstream can be used on multiple computers by multiple users. Each user can produce their own documents but instead of printing the documents themselves they are sent to a shared file and printed centrally. This can be done by staff in one office, or by staff in several locations. 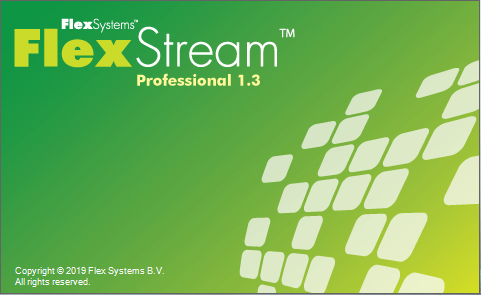 Use FlexStream for all your mail – Mailing software is not just for bulk mailings. 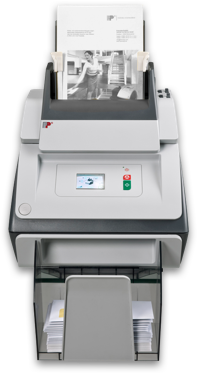 This software can also be used for single letters, daily post and transactional documents. These individual items can be held until they are ready to be printed and processed so you can benefit from collating items and combining mail to receive volume-related postage discounts. 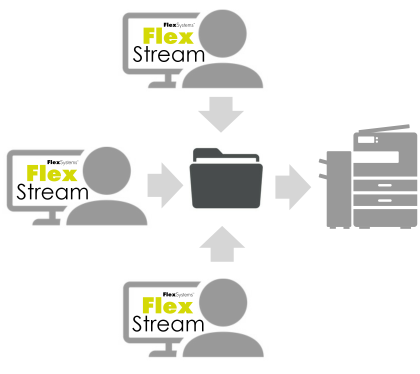 Archive copies of posted documents – The FlexStream software allows you to create exact copies of the documents you post. This includes details of the pages sent but also any other documentation you included. This information can be archived by day (multiple recipients) or by pack (contents of each envelope sent). The archived filename can include unique details to make searching your historical data easier or it can be stored within your ERP/CRM system. Accurately record processed items (create a closed loop) – this requires some additional hardware; but if you need to provide proof that you sent a document, verify the information you included, record the contents and when it was processed then you can with FlexStream. This software creates a uniquely identifiable 2D barcode for each recipient. 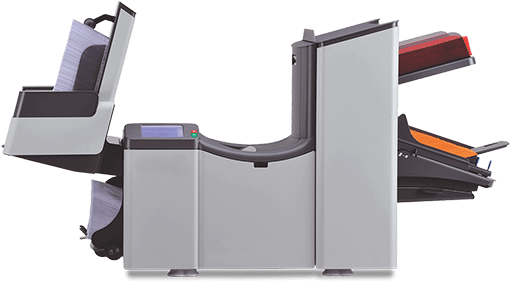 This 2D barcode is then read as each document is processed by your folding and inserting machine and then it exits the machine in a sealed envelope. Any anomalies are flagged and this data can be archived providing your business with verifiable evidence that an item was processed. Receive the highest postal discounts from Royal Mail – Checking your addresses are “clean” against Royal Mail’s PAF file and that this address is printed in the correct format will give you a discount from the Royal Mail. If you convert that data into a 2D barcode (called Mailmark) which can be read by Royal Mail’s sorting machines then you get the biggest discounts! The FlexStream system does this for you and conforms to Royal Mail’s standards so you can benefit from the lowest available postage prices. Not just for mail. Send emails too – If your business sends reminders, invoices or statements then it's likely that some of your customers or clients want these posted; others want them emailed, and some want both. Flextream was designed for printed documents, but has a built-in function to segment these and can also send documents by email. This means that customers who want a printed version will receive it by post and the ones who want it electronically will receive it by email. All of our folding and inserting machines are delivered with the capability to recognise marks printed onto your documents. 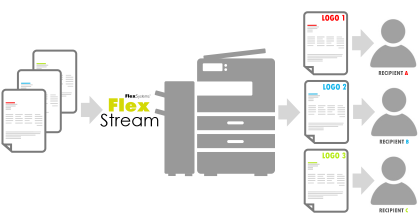 Our FlexStream software adds this intelligence to your printed documents and whilst you do not need to have it to use a folder inserter; you may want to see how it could help. We would be very happy to demonstrate this software alongside our equipment to show you all the benefits and explain the features in more detail. Our Mailing Room consultants will also share their expertise and can assist you with finding the best/most efficient way to process your mailings, and explore the available postage savings. If you have any questions about using software to make your mailings more professional, cost effective, and efficient please contact us on 01322 288890. For over 25 years FlexSystems have been developing software for the mailing industry and have designed leading software packages. This software is used worldwide by companies to improve the efficiency and intelligence of their mail, and access postage savings. My Mailing Room is very proud to be partnered with FlexSystems, and when choosing FlexSystems Software and a mailing machine from My Mailing Room you can be confident that you are getting the best product and the best support. FlexStream has been used by companies worldwide since 1993 and is trusted by all the UK’s folding and inserting machine manufacturers. This software was designed to make sending mail - printed from various computerised systems then processed using a folding and inserting machine - easy and efficient. 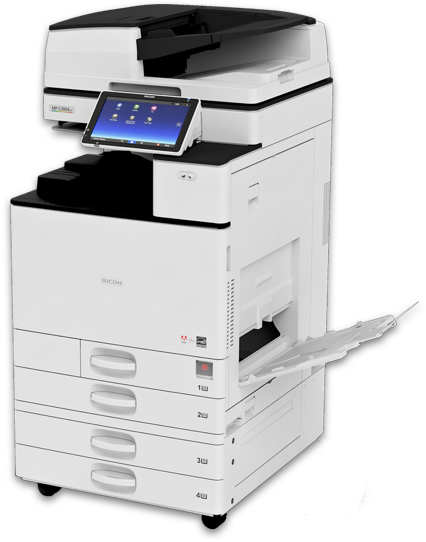 It was the first system of its kind to work with Windows and this software has been continually updated to ensure it meets the highest standards of any mailroom. Add a Mailmark 2D barcode to your mail to achieve the highest postal discounts. Easy to use interface (similar to Microsoft Office) for managing and editing your mailings. 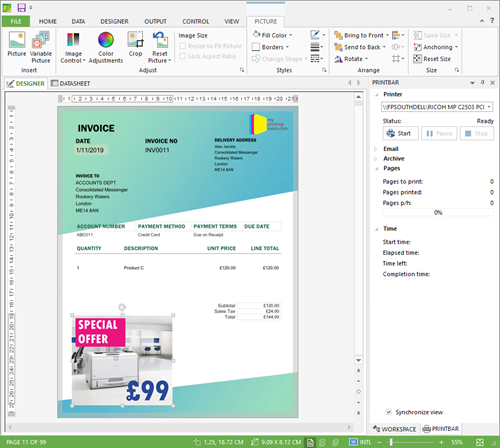 Add logos, images, text and adverts to your documents to create targeted communications for your customers. Improve mailing accuracy by checking addresses against Royal Mail's PAF file.